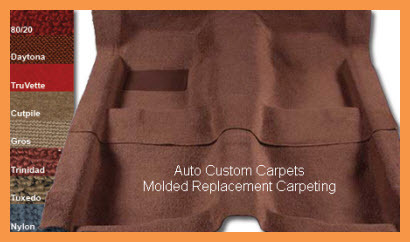 Auto Custom Carpets makes replacement carpet and floor mats for your vehicle. Auto Custom Carpets (ACC) has been around since its founding in 1977 by Jack Holland. Mr. Holland has since retired and the company is essentially employee owned. ACC manufactures molded replacement carpet for most cars and pickup trucks dating back to the mid 1940s. In addition the company makes floor mats (for cars, pickups and SUVs), trunk mats, a great selection of vacuum molded vinyl flooring and sound deadeners to protect your vehicle from excess noise and heat. he company tufts, dyes and finishes it's own carpeting. Manufacturing facilities are located in Alabama and Georgia, while the corporate office is in Anniston, Alabama. ACC is the favorite of car restoration specialists who want to specify original fit, material and color for their current projects carpet replacement. In addition, ACC sells an essential line of auto restoration supplies for Ford, Chevrolet, Toyota, Nissan, Dodge, Chrysler and Honda. So if "tricking out" a car or pickup is your thing, ACC is your restoration specialist. Automotive replacement carpet is what Auto Custom Carpets is really about. From cut and sewn carpeting, cut with CAD controlled CNC equipment for early model cars(usually before 1960), to precisely molded carpet sets for later models(from early 1960's to present time), ACC makes replacement carpet in seven of the original automotive carpet materials plus their own premium ultra plush Essex carpeting. The original carpet materials include TruVette, CutPile, Loop, Nylon, Daytona, Tuxedo and Gros Point. ACC lets you choose from over 200 original OEM colors and 15,000 styles. Most of the carpet materials may be backed with rubber latex or polyethylene. Heel pads are placed on the carpet using techniques similar to the OEM. You get padding if there was padding on the original carpet. Mass backing may be optionally added to any molded carpet set to help insulate against heat/cold and deaden vehicle noises. Edges on the Cut and Sewn carpeting are either vinyl or serged depending on the original vehicle spec. And don't forget those not so optional items like kick panels, door panels, wheel wells and tail gate pieces, all of which you can procure from ACC. Note: Daytona can only be used in cut and sewn applications as it cannot be molded. But the best thing yet about ACC is even if the kids have destroyed the interior carpeting in your nice, new, shiny SUV you don't have to worry. ACC provides a convenient, thrifty replacement carpet kit for almost every SUV on the road today. Don't have kids? ACC recommends you change your vehicles carpeting about every 10 years. It gives you a chance to replace that old worn out looking carpet with bright, colorful new carpet. Make your car or truck happy. And who knows what you'll find under your old carpeting! One reason carpet gets dirty, worn and smelly is trapped moisture. You've got some nice rubber car floor mats or a beautiful custom set of luxury mats and everything is fine until the weather gets wet, coffee or soda get spilled or the kids drag lots of gooey mud into the car. Then the moisture from all that stuff gets trapped between the rubber on the bottom of your mats and the vehicle's carpeting. Uh! Oh! Now the little moldies and mildews begin to grow and smell up the vehicle and degrade your carpet. So you ask yourself, is it easier to use universal absorbent car truck mats to prevent this situation or do you like to replace the carpet in your vehicle? I got the absorbent mats. 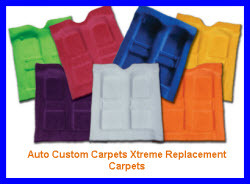 Do you need to protect the carpeting in your car, pickup, van or SUV? Auto Custom Carpets has you covered! They make floor mats for vehicles going back to the mid 1940s that custom manufactured to fit the exact make, model and year of your vehicle. And these mats are all die cut or molded to fit the dimensions of your vehicle. 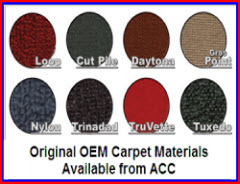 They fit perfectly and are crafted using the OEM colors and materials your vehicle was born with and match the color of the replacement carpeting you just bought from ACC. ACC's vehicle floor mats all come backed with Griplock non-stick backing so they don't slide all around on your nice new carpet. Grommets are standard on some models. Just a quick mention here on behalf of trunk mats. You don't really have a complete restoration job or really cool vehicle unless your trunk mat is cherry. 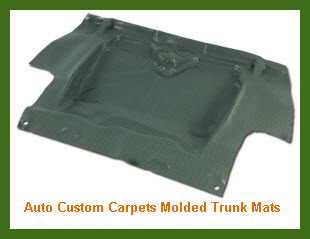 Auto Custom Carpets makes trunk mats from original patterns and in original colors to perfectly fit your vehicle. And depending on what you use your trunk for, you'll appreciate the fact that you can order a trunk mat from ACC in fleece, felt, foam, bertex (a brown fiber similar to burlap) or vinyl. And the fit, ahhh, just look at the pic next to this info. Like ACC says there are times when carpeting just doesn't do the trick. Whether it's an old Dodge that came with a vinyl floor or you just can't justify putting carpet in a pickup you only use at work sites, sometimes you just gotta have vinyl flooring. 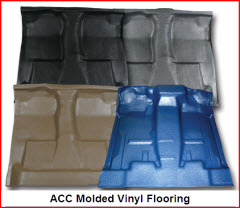 So ACC makes it easy on you by providing a heavy duty alternative to a carpeted floor. So you're gonna put new carpet in your vehicle. It's a great idea to revitalize the interior of your car, truck, SUV or van. So at the same time why not install one of ACC's Sound Deadener products. Available in 3 styles the sound deadener adds a layer of insulation under your carpeting that cuts down on road noise and stabilizes the temperature inside the car. The sound deadener product comes "cut to fit" for some vehicles and is available in sheets for custom projects. Here's some quick info on the 3 styles. An acoustic noise barrier made from asphaltic mastic laminated to a poly film on one side and black paper on the other side. It's about 1/8" thick and was used in most vehicles in the 1960's, 1970's and 1980's that came with factory carpeting. This product is typically used as a heat barrier. It consists of jute padding laminated with a foil backing on one side. It's about 1/4" thick and is commonly used in most makes and models as a heat barrier for the catalytic converter and as an integral part of the firewall. Similar in nature to the EVA, the Mastic with Pad product from ACC acts as an acoustic noise barrier. However it differs in construction from the EVA. Made from a 3/8" jute pad laminated with a 1/16" layer of asphaltic mastic on one side and a black paper backing on the other side, this product is primarily used in the Chevrolet Corvette to improve the interior experience.